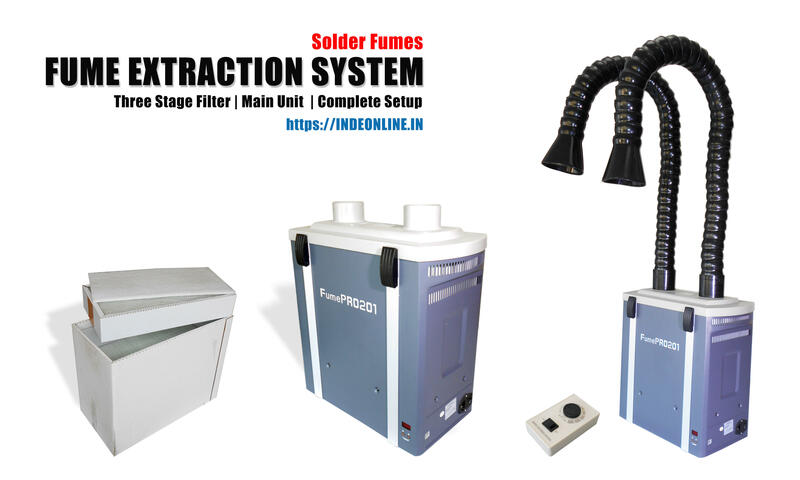 Home > "Fume Extraction Systems · Fume Absorbers (Solder · Chemical · Laser Dust)"
Buy the best Solder Fumes Extraction System, Laser Dust Extraction System, Chemical Fumes Extraction Systems and Table-clamp Type Fume Absorber / Table-top Type Fume Absorber at competitive price in India online. We also keep all types of spare parts and filters for our fume extraction systems. Repeat…repeat orders customers list is growing on a daily basis. This 2-operators ready-to-use solder fumes extraction system top is fitted with metal plate and 3-stage filters. This fume extraction system comes with powerful and maintenance-free brushless turbine. It is designed for continuous and reliable working on production line. Couple of 100's (in repeat orders) working reliably all over India for the last many years. 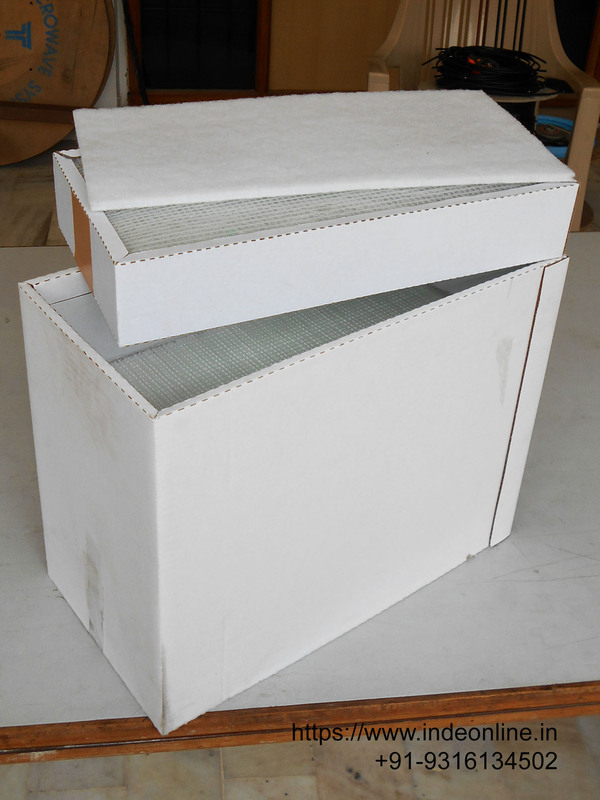 Filters design removes hazardous gaseous/adhesive substances from fumes. Low running cost as normally low cost Pre-Filter mainly need replacement periodically as and when there is choking of fumes extraction. FES2-50ESD is a reliable and really effective volume extraction type 2-operators ready-to-use Solder Fume Extraction System. It is designed for continuous and reliable working on production line. Its powerful and maintenance-free brushless turbine combined with electronic speed control, provides clean working environment at low maintenance cost. The electronic Speed Controller regulates air-flow volume continuously. It is a ready-to-use Solder Fumes Extraction System fitted with metal plate and 3-stage Filters: Pre-Filter, Middle Filter and HEPA Filter. 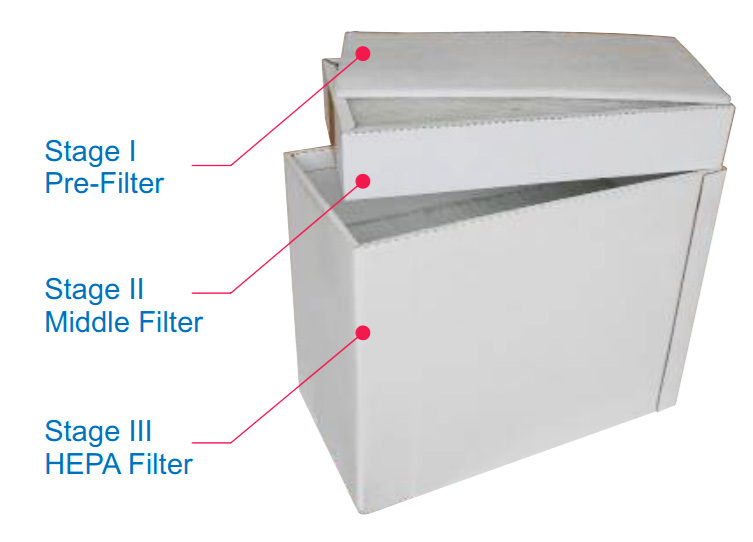 Combination /Charcoal of these Filters cleans polluted air by separating 99.9% contaminated solder fumes. This System is designed for use both in industrial and laboratory environment. All it needs is an input Power Supply only. This 2-operators solder fumes extraction system comes with 3-stage filters for 99.97% fumes cleaning. Pre-cut metal plate increses life of all three filters. Very reliable and powerful brushless turbine of this solder fumes extraction system operates silently with <60 dBA. Couple of 100's (in repeat orders) working reliably all over India for the last many years. 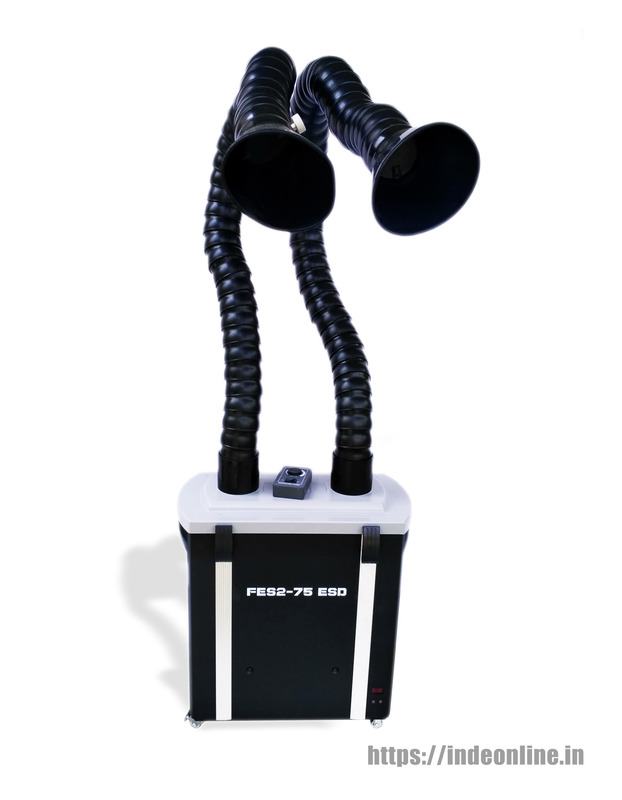 FES2-75ESD is a reliable and really effective volume extraction type 2-operators ready-to-use Solder Fume Extraction System. It is designed for continuous and reliable working on production line. Its powerful and maintenance-free brushless turbine combined with electronic speed control, provides clean working environment at low maintenance cost. The electronic Speed Controller regulates air-flow volume continuously. 2-operators ready-to-use Solder Fumes Extraction System Model FES2-75ESD is fitted with 3-stage Filters: Pre-Filter, Middle Filter and HEPA Filter. /Charcoal Combination of these Filters cleans polluted air by separating 99.9% contaminated solder fumes. This System is designed for use both in industrial and laboratory environment. All it needs is mains input Power Supply only. 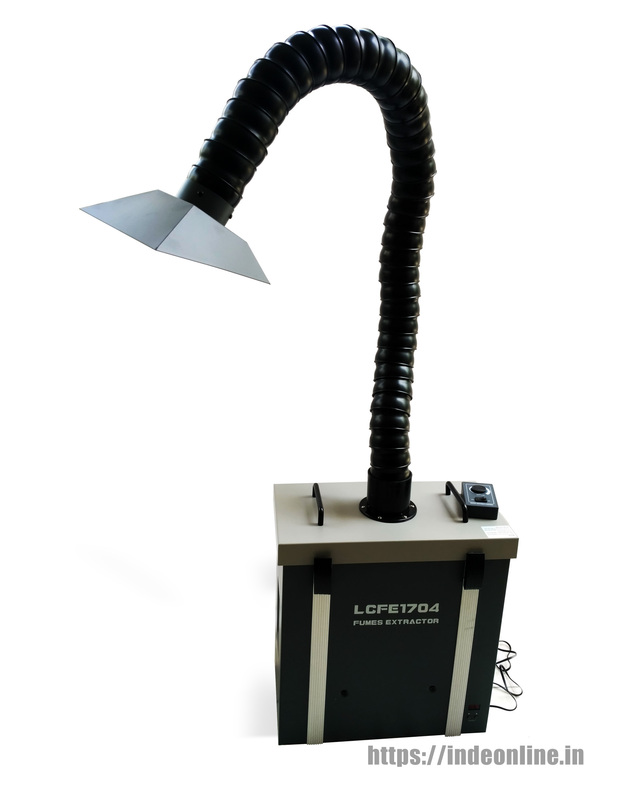 It is a powerful low cost high efficiency solder fume extraction system. Couple of 100's (in repeat orders) working reliably all over India for the last many years. Triple-filter design removes hazardous substances from fumes. Low Cost Fume Extraction System for 99.97% clean air. 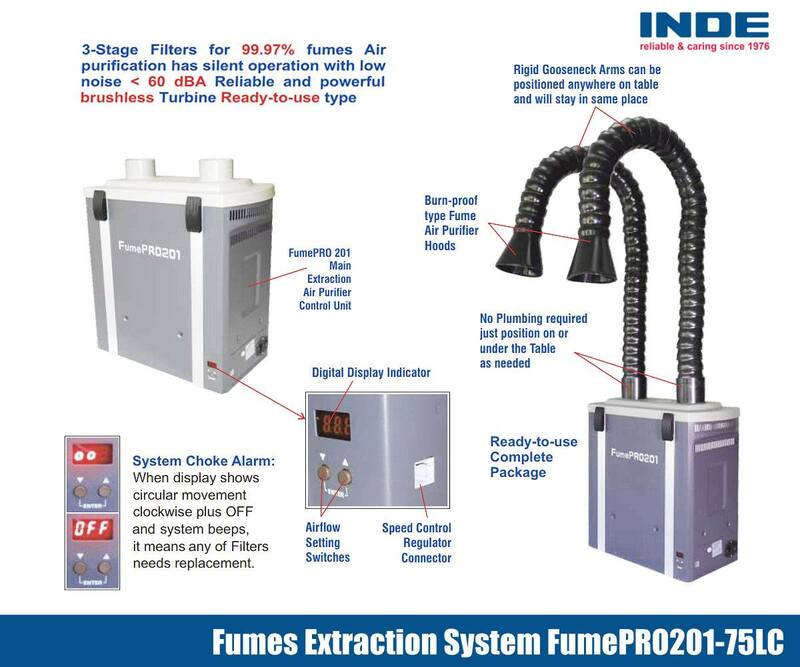 Our powerful fume extraction system (fume absorber or fume extractor) FumePRO201-75LC is a blessing to all those service professionals who unknowingly inhale toxic solder fumes. By using this fume extraction system you can rest be assured that 99.97% of the air around you will be free of harmful solder fumes. It is a powerful 2-operator solder fumes extraction system for ultimate air purification for your service center or manufacturing lab. If you are looking for a perfect portable fume extractor or a solder fume absorber at the best price in India, then you are on the right page. Some of our clients for Fume Absorbers, Fume Extractors and Fume Extraction Systems in India are ABB Ltd. (Bangalore), Nuclear Power Corporation of India Ltd., HCL Technologies Ltd. (Chennai), Hindustan Areonautics Ltd. (Hyderabad)., Amphenol Omniconnect India Pvt. Ltd., Aviohelitronics Systems Pvt. Ltd. (Bangalore), Bharat Electronics Ltd. (Jalahalli, Bangalore), Bharat Electronics Ltd. (CRL, Bangalore), Bharatiya Reserve Bank Note Mudran Ltd. (Mysore), Larsen & Turbo Ltd. (Mumbai), Lupin Ltd. (Pune), Microchip Technology India Pvt. Ltd. (Chennai). 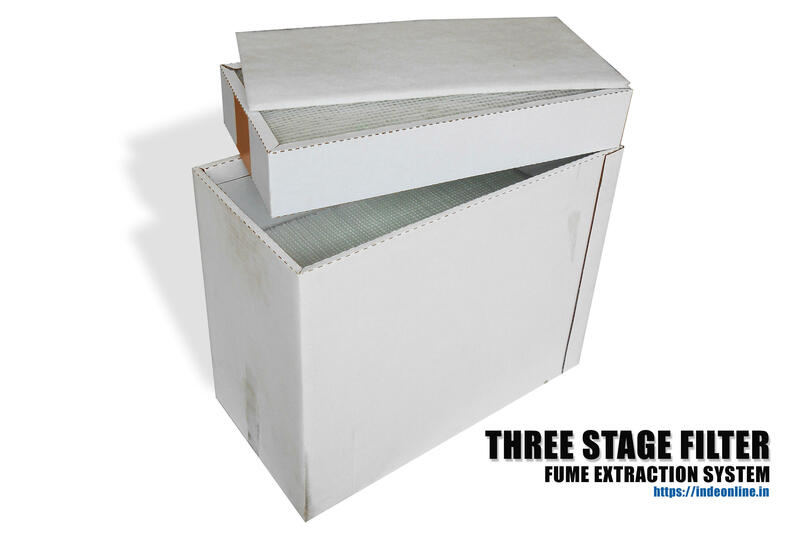 Pre-Filter: It is the Stage 1 of the solder fume filtration process. The ‘Pre-Filter’ filters the bigger size particles for prolonging the life of both Middle and Main Filters. This filter is made up of polypropylene. Middle Filter: It is the Stage 2 in filtration of solder fumes. It filters coarse size fume particles to prolong the life of expensive HEPA Filter. This filter is made up of fiberglass. HEPA Filter: Main HEPA Filter is the Stage 3 filter. This Filter is of activated charcoal type which absorbs all harmful gas substances to provide clean air finally to the engineers or professionals working at industries or research centers. This filter is made up of fiberglass. The perfect combination of these Filters cleans polluted air by separating 99.9% contaminated solder fumes. 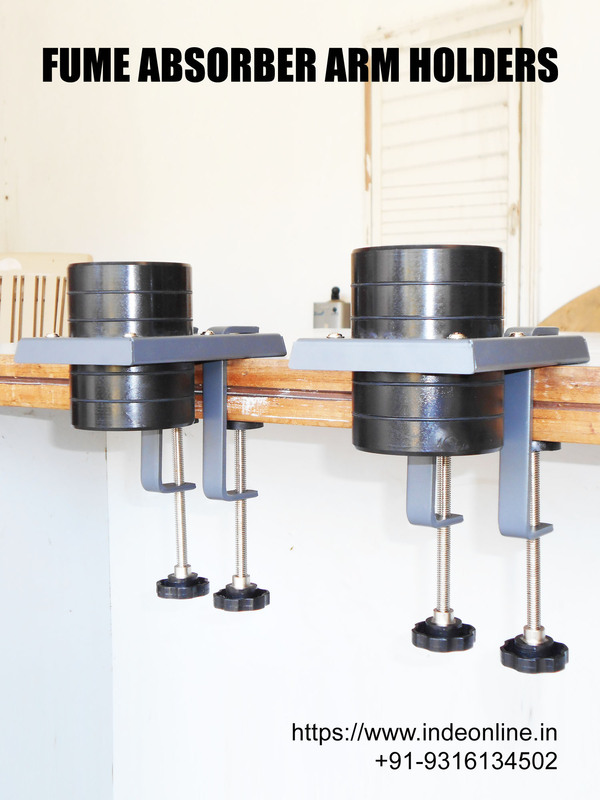 This System is designed for use both in industrial and laboratory environment. 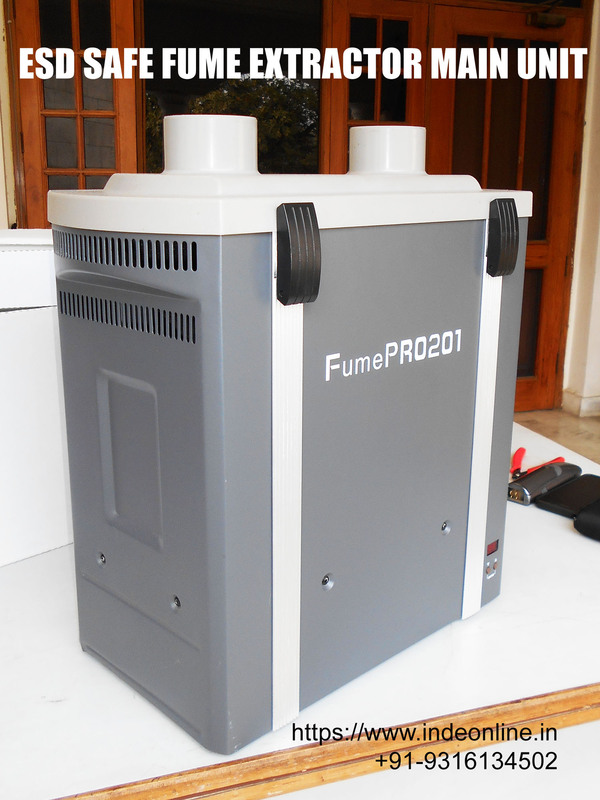 The only thing required by FumePRO201-75 is the Mains Input Power Supply. These Filters are tested at the laboratories of INDE Enterprises for Efficiency and Resistance and were tested using sodium flames.Under normal circumstances the Pre-Filter only needs periodic replacement when there is less suction of solder fumes. All 3 Filters mentioned above should never be washed nor should be cleaned with compressed air at all. 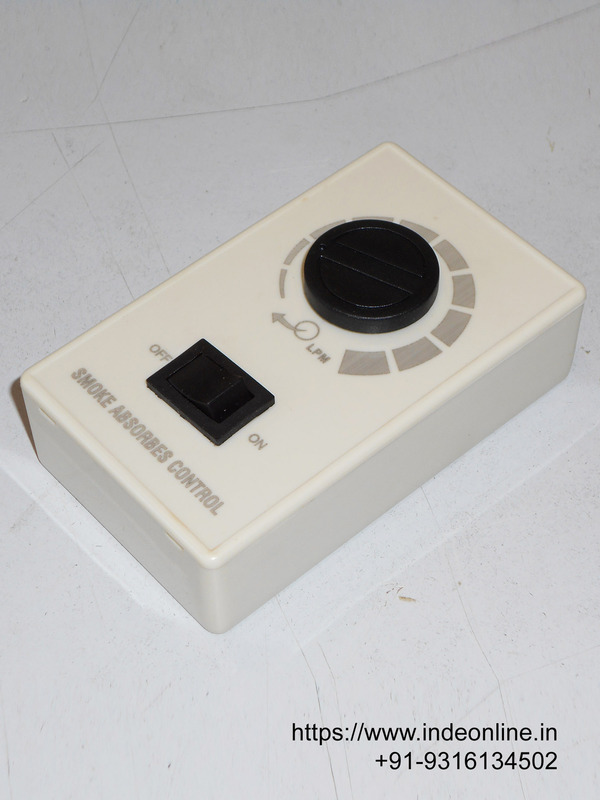 At INDE Enterprises we provide quick delivery of all spare parts as we keep enough stocks of the same all the time. 3-Stage Filters for 99.97% fumes Air purification has silent operation with low noise < 60 dBA Reliable and powerful brushless Turbine Ready-to-use type. Included accessories ensure hassle-free and immediate easy-to-start operation for 2-operators. 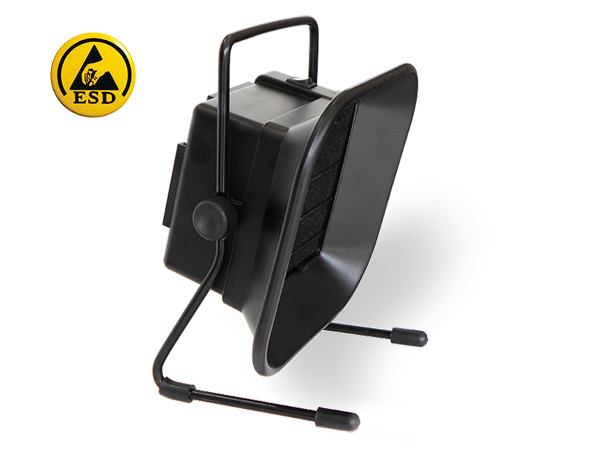 ESD Safe both Air Purifier Extraction Arms are easy-to-manoeuver positioning as is required. Virtually maintenance-free Brushless DC Turbine generates higher suction pressure. Highly reliable & powerful brushless turbine yet has low noise (< 60 dBA) in operation. Low cost Pre-Filter only needs periodic replacement, this ensures low maintenance cost. Our after-sales-service policy of 42 years record, all spare part are immediately available. This model is specially meant for those applications where clamping of Fume Air Purifier Hoses is necessary with the table. 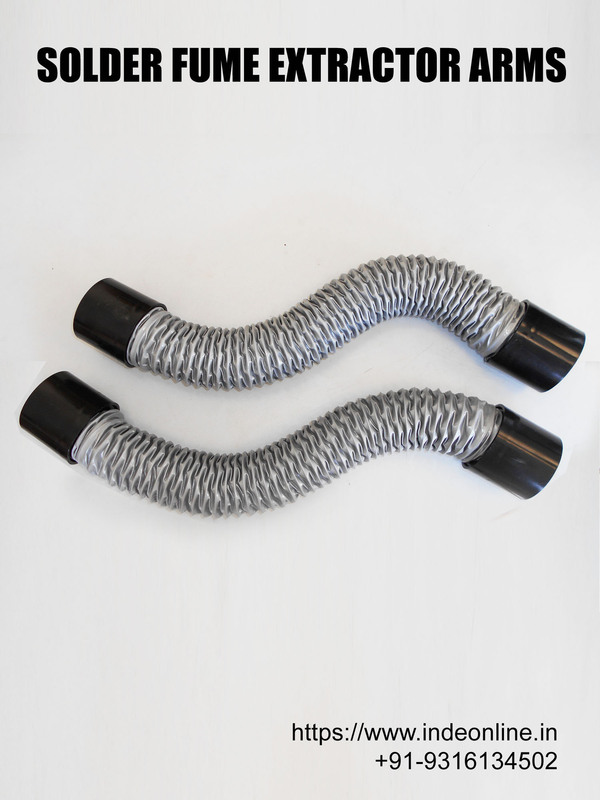 This also is supplied with ESD Safe Fume Air Purifier Hoses & Hoods. This Fume Air Purifier is specially meant for those applications where clamping of Fume Hoses is necessary with the table. Hassle-free easy-to-start operation with all inclusive kit supplied. Easy-to-manoeuver positioning of Fumes Extraction Arms. Reliable & virtually maintenance-free Brushless DC Turbine. Has low noise (< 60 dBA) in operation continuous running. Filters design purifies hazardous gaseous/adhesive substances from contaminated fumes. Readily availability of all spare parts from stock. ● Powerful maintenance-free Brushless Turbine ● Supplied with all accessories. 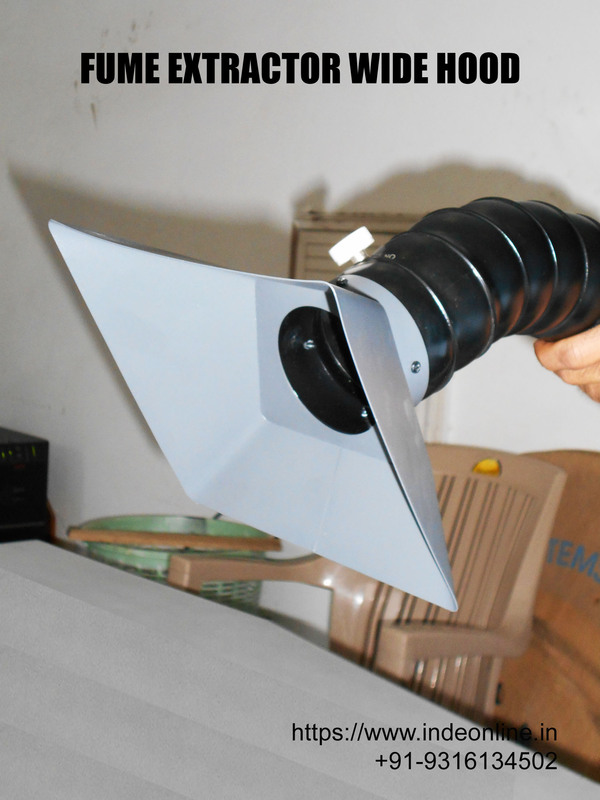 Easy-to-manoeuver positioning of Fume Extraction Arm. Has low noise (< 65 dBA) in continuous running operation. Special Main Filter with its last stage of Alkaline type, makes sure to remove obnoxious chemical fumes Air Purification. Middle Filter and Main Filter are in Metal Frames. Ready availability of all spare parts from stock. This is hi-end volume extraction air purifier and ready-to-use Chemical Fume & Laser Dust Extraction Air Purifier. It is designed for continuous working reliably on main production line. It has very powerful and maintenance-free Brushless Turbine and Electronic Speed Control Unit. Its metal framed special Middle Filter and Main Filter provide purified working environment. The electronic Speed Controller regulates air-flow volume. Ready-to-use Chemical Fumes and Laser Dust Air Purifier Model LCFE1704 is fitted with 4-stage Filters: Pre-Filter, Metal Framed Middle Filter, another Pre-Filter, Metal Framed special Main Filter with last alkaline stage. Combination of all these Filters purifies chemically polluted air by absorbing these obnoxious fumes. This Air Purifier is designed for use both in industrial and in laboratory environment. All it needs is merely mains input Power Supply. Length of the Air Purifier Extraction Arm is easily adjustable, as this is made from press-fit type small sections which are easily adjustable in length by selection of these sections as per required length. A must have Solder Fume Absorber for every Soldering Operator’s Workbench. 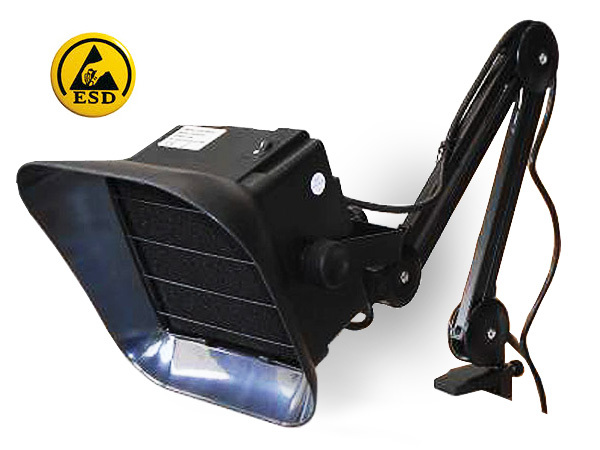 Adjustable Extension Arm & Angle of Fume Absorber provide unique advantage that it is directly on the top of solder fumes. Removes noxious fumes quickly, operator will not inhale the same directly. Solder fumes are harmful to health particularly if you are inhaling it for a long period of time while working on electronic circuits. The more flux you use to obtain perfect solder joints (on SMD circuits) the more fumes are generated. Service technicians become sensitized to flux fumes, especially from the older rosin flux used in cored solder and get breathing problems. 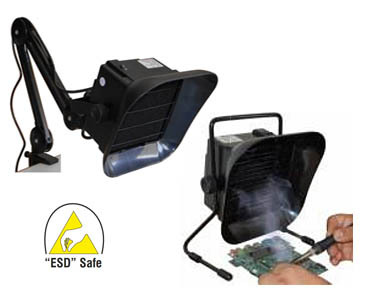 INDE Enterprises offers two of the most advanced ESD Safe Solder Fume Absorber also known as Solder Fume Extractor in India at the most affordable price for service technicians and manufacturing units. Spending money on Solder Fume Extractor is worth every rupee. We have two types of Solder Fume Absorbers - Table top type and Table Clamp Type. One should never miss these on any Soldering Operator’s Workbench. Both our Fume Extractors Model I493 and Model I493–A removes noxious solder fumes quickly and completely so that operators will not inhale the same directly. It will leaves the operator with clean air to breath and much more lively environment to work in. The clamp design is done in such a way that it saves a lot of space on your workbench. It gives you more room on your workbench for keeping other tools like Smart tweezers, Oscilloscope, Electronic Magnifying Glass and Soldering Stations. In addition to saving space on the workbench Fume Absorber Model I493-A has adjustable extension arm positions that can be set at a desired angle or position to maximize the absorption of the solder fumes. The replaceable filter (Part No. IRF493) used in these fume absorbers are made of refined urethane and use activated high absorption carbon. These filters conform to international safety standards set in various countries including India. Attachment to connect the hose to re-direct the solder fumes outside the working area. Attachment to re-direct the solder fumes so that the fume is not inhaled by other operators.